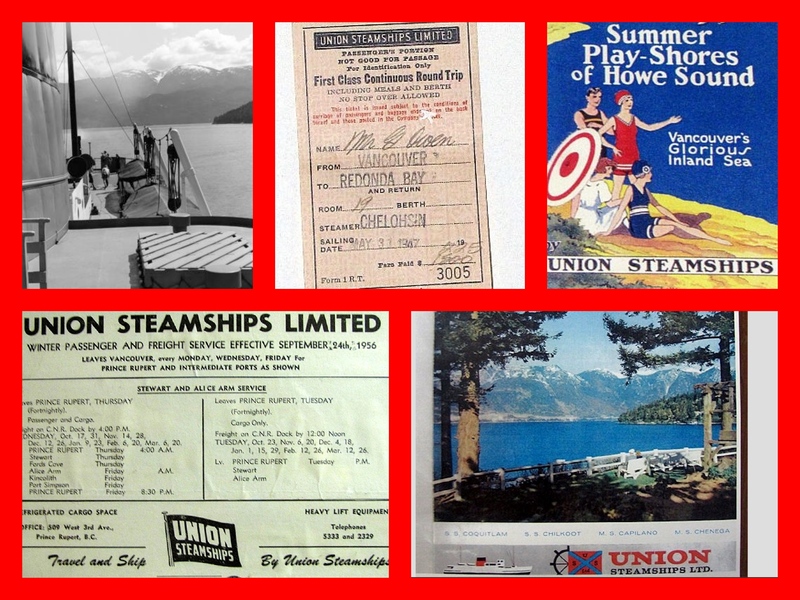 Until the late 1950s, Union Steamship Company served the small coastal towns of British Columbia, the Queen Charlotte Islands and offered cruises to Alaska. The company was founded in 1889 by John Darling, the director of a New Zealand shipping company who recognized a great need for a scheduled service that would transport supplies and work crews to various northern BC sites. He also realized there was little competition in Vancouver. Darling assembled an assortment of vessels, creating a successful business. The Union fleet became synonymous with pioneers and loggers, and for 70 years, ships sporting the company’s black and red funnels plied the coast, servicing logging camps, canneries, mines and coastal communities. 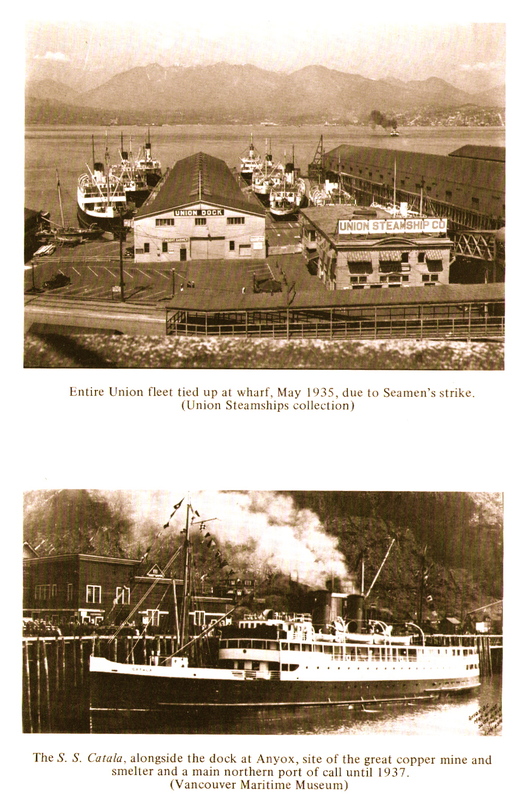 The Union Steamship Company was the first line to use Vancouver as homeport. 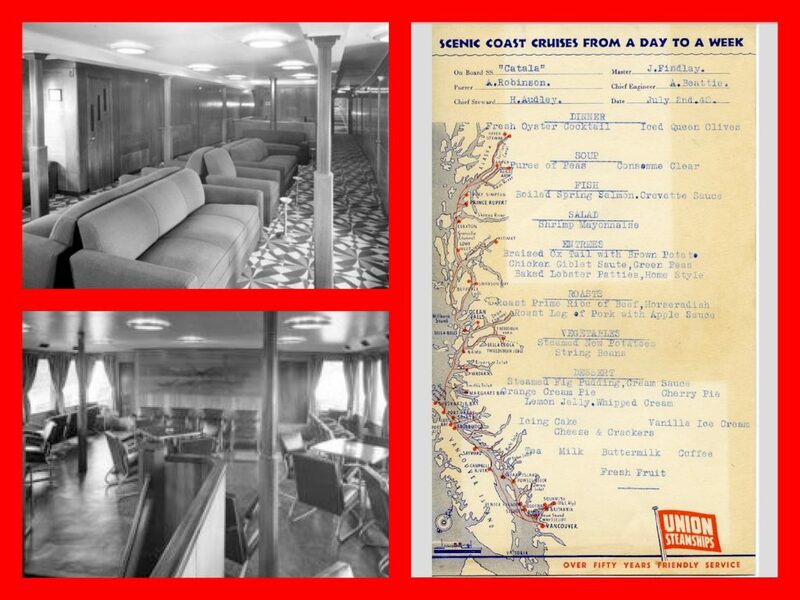 While the Union Steamship Company was the smallest of the three BC cruise companies that handled cruises to Alaska, it built up a great tradition that resulted in several published histories of the company. Whistle Up the Inlet and its sequel Echoes of the Whistler by Gerald A. Rushton, Union Steamships Remembered by Art Twigg and later The Good Company by Tom Henry. Comox, Capilano, and Coquitlam were a trio of early Union steamships assembled and launched in Vancouver. 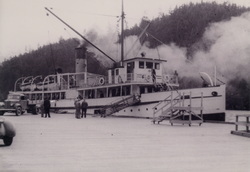 Most of the Union fleet that was used for servicing logging camps and pioneer settlements were small, rough steamships. 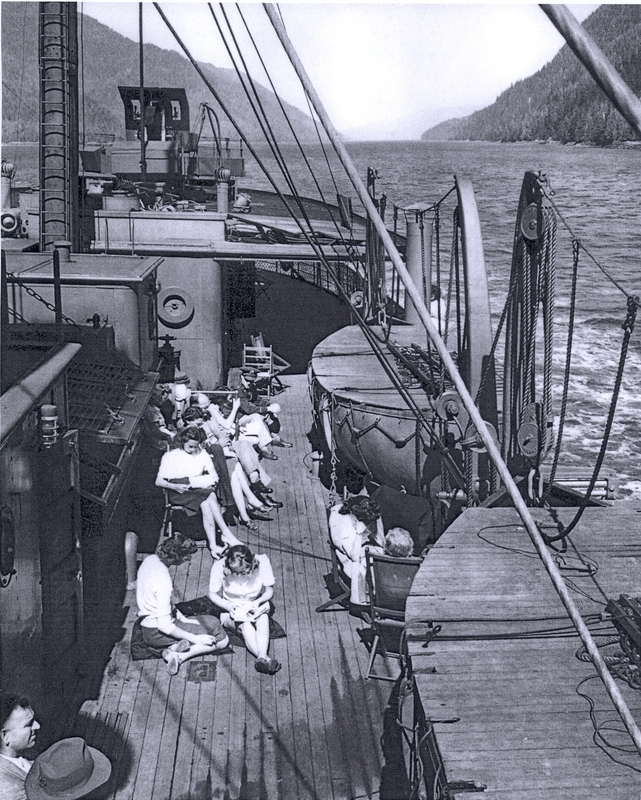 The wooden-hulled Cassiar was probably the most famous, if only because loggers were allowed to wear caulk boots on board, or even to bed. It was also equipped with an onboard bar and jail. When the Union Steamship Company decided to get into the tourist excursion business, it acquired steamers that were a cut above the company’s usual vessels. These boats received the “Lady” prefix, in keeping with their elevated status. The first was Lady Evelyn, followed by two former Royal Navy minesweepers (Swindon and Barnstable) that were re-launched as Lady Cynthia and Lady Cecilia. The flagship of the Union’s day or overnight excursion fleet was Lady Alexandra, built in 1923-24. 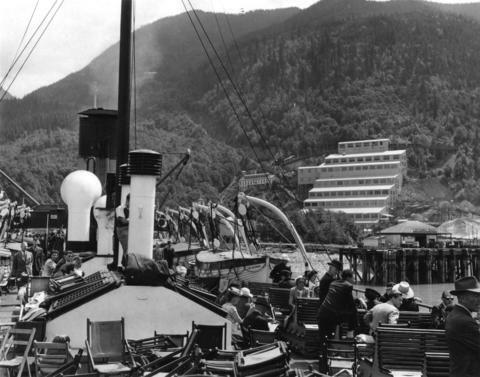 During the depressed 1930s, the ship provided an exotic, if brief, getaway for hundreds of Vancouverites who could afford the $1 round-trip fare to Bowen Island. It boasted a promenade deck that ran three-quarters of its 225 ft (69 m) length and an excellently equipped restaurant. 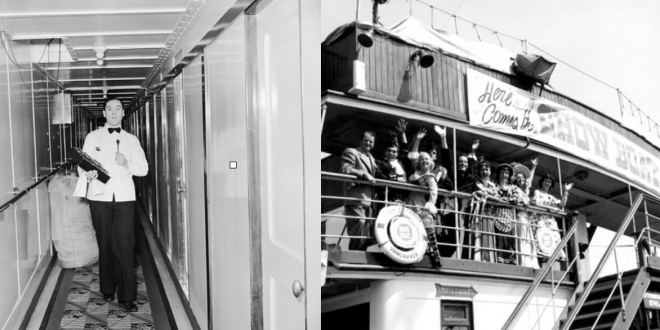 Maintaining order on a ship carrying up to 2,000 partying passengers often proved challenging—crew members had to lug drunks off the ship, stacking them like cordwood onto freight dollies. In 1937 alone, Lady Alexandra carried 171,000 passengers. After WWII, many former warships were again purchased by steamship lines and converted to passenger liners. One such example is the former Royal Canadian Navy corvette that the Union Steamship Company turned into the steamer Chilcotin. Sadly, the company’s haste in the uneconomical conversion of war-surplus vessels, along with management failed to secure greater tonnage prior to the war, encouraged its decline. In the end, the remaining active Union fleet was sold to Northland Navigation Company. 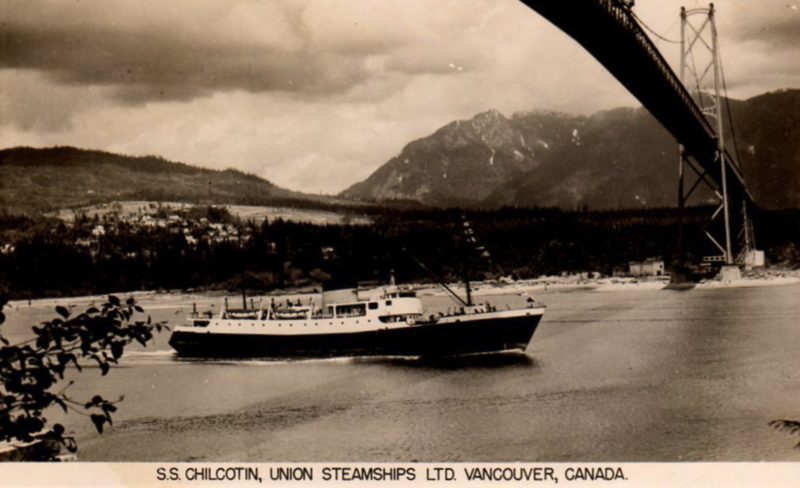 Chilcotin saw Union service from 1947-1958, primarily for Alaskan summer cruises. Both Coquitlam II and Camosun III worked the northern British Columbia and the Queen Charlotte Islands routes primarily but also spent several seasons in Alaska cruise service. 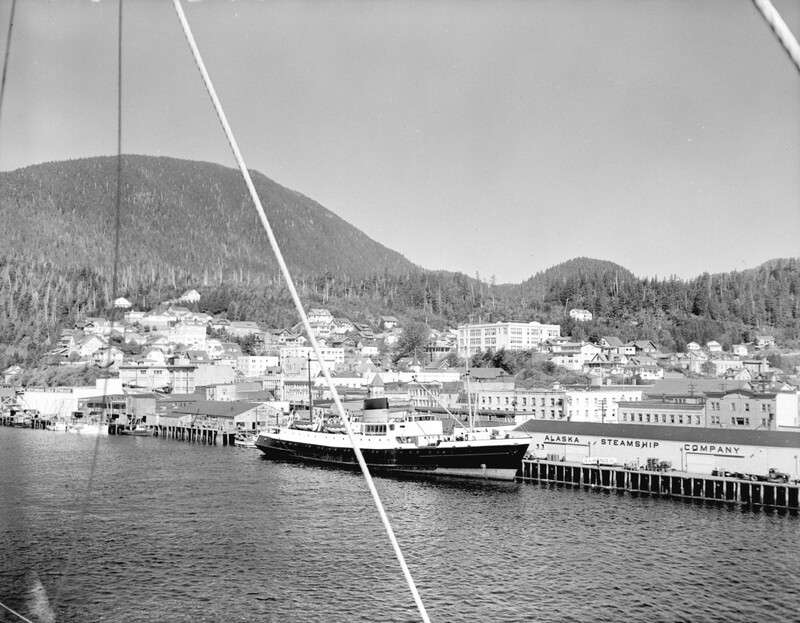 In 1958, both vessels were sold to Alaska Cruise Lines and renamed Glacier Queen and Yukon Star, respectively. Although all vessels were sold to Northland Navigation in 1959, the company remained in the land business. Previous: Elizabeth Taylor sailed many times times aboard Cunard Line’s RMS Queen Mary, RMS Queen Elizabeth and the QE2. Next: Juan Bastos carries on the tradition of John Singer Sargent with a Latino American influence.